Virginia Bedinger Lucas (1837-1867), frequently called the Pastoral Poet of the Valley, was born at the family home, Rion Hall, in Jefferson County, West Virginia, in 1837. She was the daughter of Virginia Ann Bedinger and William Lucas. Having lost her mother, in infancy, Virginia Bedinger Lucas was adopted by a widowed cousin, Mrs. Ann Elizabeth Davis, nee Ranson. Ann Elizabeth Ranson Davis was the daughter of Matthew Ranson and Elizabeth Morgan. Elizabeth Morgan was the daughter of Abel Morgan and Elizabeth Bedinger. Elizabeth Ranson Davis later married Daniel Paine Bedinger, son of George Michael Bedinger and Henrietta Clay, and moved to Kentucky, taking her little adopted daughter Virginia with her. There Virginia Lucas, surrounded by everything that love and tenderness could suggest, spent her girlhood days. About 1856 she was sent to Staunton, Virginia, to a school for girls. She never went back to her Kentucky home for, at the urgent request of her father, she dutifully though reluctantly returned to "Rion Hall", the Lucas Family home near Shepherdstown, West Virginia, where she spent the remainder of her brief life. Here among flowers and trees and other beauties of nature, she found inspiration for her poems. Her life was not without its romance. Her cousin George Washington (son of John Thornton Augustine Washington and Elizabeth Conrad Bedinger), of "Cedar Lawn" was her suitor, but because of their relationship (first cousins) her father opposed a marriage between the two, and the disappointed suitor went to Missouri never to return. Virginia Bedinger Lucas died in 1867. It was her poet brother, Daniel Bedinger Lucas, who felt her death most keenly; for between the two there had been a rare and beautiful comradeship such as that which blessed the lives of William and Dorothy Wordsworth. 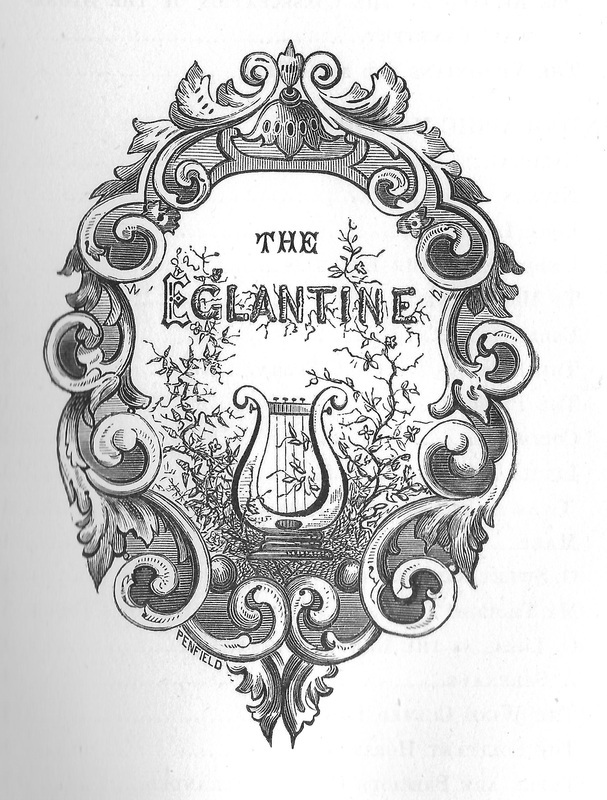 "It seems to me in comparing the earlier and later pieces of Eglantine that she had attained a knowledge of what constitutes Poetry, as distinguished from the mere spontaneous and uncultured outflow of poetic emotion and that, at her death, she was treading closely upon that enchanted domain to breathe whose atmosphere is inspiration indeed and where all things of beauty and harmony supply the ambrosia which nourishes the soul of the genuine poet." "But whether she would have attained the power of the Poet or not, "Eglantine" was endowed as all who knew her will testify, with a rare susceptibility to the charms of nature. Flowers were to her companions and interpreters; with them she conversed, and seemed almost in them to renew her own being; her fancy could recall the exact shades of coloring, the dentations and involutes of almost every wild-flower which adorns her own beautiful, native Shenandoah Valley; with a pencil she would sketch, or with her scissors cut any one of them at will, until they were reproduced, apparently in the minute detail and exquisite grace of Nature herself." 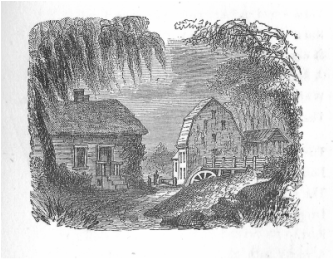 "The fidelity of her description of rural scenes on the banks of the Shenandoah, some of which the artist has illustrated, will be recognized by those who were lately her fellow-citizens of the Virginia Valley; and beyond these the readers of this volume are scarcely expected widely to extend." "It is a beautiful thought that the Flora of the region where sleep our ancestors is in fact related to us; that a portion of the bodies from which our own are descended, lives also in the plants which surround us; that we ourselves shall survive them; that Flowers are the Resurrection, and Nature the Immortality of the body!" To fill in a little on the narrative of Virginia's suitor George Washington, his sisters Mildred Berry Washington and Susan Ellsworth Washington married the brothers Solomon Singleton Bedinger and Henry Clay Bedinger. These two couples moved to Missouri in about 1856 along with George Washington and several other siblings. George Washington, however, did not stay in Missouri but moved to California, where his brothers Benjamin Franklin Washington and Lawrence Berry Washington had gone as “forty-niners” during the gold rush. Benjamin Franklin Washington was Collector of the Port of San Francisco 1857 at about the time George Washington came to California. George Washington became the editor of a Sacramento newspaper. In 1861 at the beginning of the Civil War, he returned to Missouri and joined the Confederate forces. He served as a private in the Missouri State Guard, Co. E, 10th Regiment Cavalry. In March, 1862 he was wounded at the at the battle of Elkhorn, Arkansas. Ironically, Virginia Bedinger Lucas passed out of life in 1867 in her thirtieth year and her father outlived her by another ten years. Four years after her death, George Washington, married Mary Dempsey. He settled in Johnson Co., Missouri where he lived the remainder of his life. Virginia B. Lucas published her pastoral poetry in various Southern journals over the nom de plume of "Eglantine." "Disappointment in love, the death of her brother, William Lucas, in the Southland, the desolating years of war, and its accompanying loneliness and anxious sorrow may well account for the minor strain in her poetry." Her lost love would surely seem to be reflected in "The Blue Forget-Me-Not." The biographical sketch of Virginia Bedinger Lucas is based primarily on the writing of Ella Mae Turner who featured Virginia's poetry in her book, "Stories and Verse of West Virginia," published by The Mennonite Publishing House, Scottdale, Pennsylvania, 251 p., copyright 1923 and 1925. Corrections and additions to Turner's sketch were made based on biographical and genealogical information. The book containing a collection of poems of Virginia Bedinger Lucas, entitled "The Wreath of Eglantine" was edited by her brother Daniel Bedinger Lucas whose poems are also contained in the book. The book was published in 1869 by Kelly, Piet & Company, Baltimore. Page revisions 08/03/15 and 07/03/17.